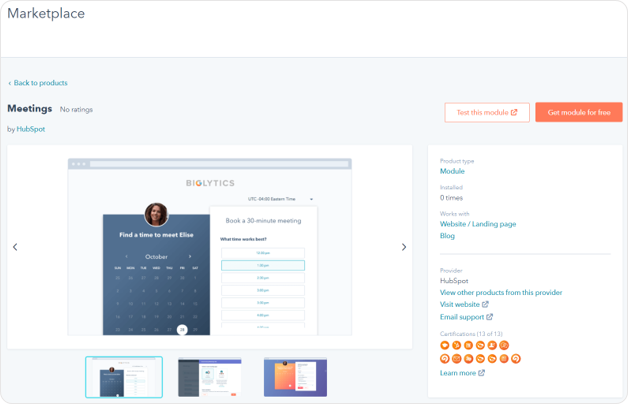 HubSpot’s meetings tool lets your sales team connect with prospects quickly and easily --- cutting out the back and forth that usually ensues when you are trying to book a meeting with someone. But as we all know, your sales team’s success is closely tied to how well your marketing team can generate qualified leads for them. The meetings module within the marketplace aligns the CMS with your sales tools like never before, and makes it easy for your sales and marketing teams to collaborate to grow your business. At HubSpot our CMS has always been tightly integrated with our CRM, which makes the ability to personalize content easy. But prospects using other solutions struggle with getting this same information shared between systems without manual integrations and development time. Today, with the Meetings module we’ve taken one more step to have a close tie-in between the CRM and CMS. Navigating to the modules section of the marketplace, you’ll see the option to download the meetings module to your portal. Once added to your template, content editors will have the ability to select a Meetings link that they want included on any of their pages. The meetings module is available to any Sales Hub Starter user who also has Marketing Hub Basic, Professional, or Enterprise --- and is in the beta of the new design manager. If you would like to use the new meetings module, you can request access to the design manager beta here. Currently, HubSpot’s modules are only available in English. The rendered module will respect any localization rules set on the meetings link, but labels and help text for the module will only appear in English. We are actively working on localizing all modules, and soon they will be available in all languages supported by HubSpot.